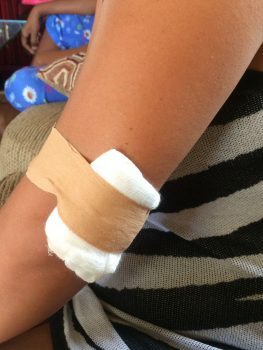 A cashier and supervisor from an East Bank Demerara night spot are nursing gunshot injuries following an attempted robbery during the wee hours of yesterday. Stabroek News learnt that the shooting occurred as Kathy Vyphuis, the cashier at Cheers Bar, arrived home in Plantation Providence sometime after 2 am. As Vyphuis was exiting the car, driven by her supervisor Tommylee Stephenson, 52, of Eccles, East Bank Demerara, a man wearing a mask rode up to the car on a bicycle and held them at gunpoint. According to a police statement, the driver was shot while he was still seated in his car. The statement went on to explain that the woman was then followed and relieved of a bag containing valuables by the said bandit, who also discharged a round which struck her on the left hand, before making good his escape. Stephenson is currently hospitalised at the Georgetown Public Hospital. Vyphuis, who is the daughter of retired Assistant Commissioner of Police, George Vyphuis, yesterday told this newspaper at her Providence home that she is terrified and remains fearful for her life. The distraught woman explained that when they arrived in front of her house, the bandit pulled up on the driver’s side of the car and pointed a gun at Stephenson. Kathy Vyphuis explained that she ran after Stephenson began to drive off. She noted that as she ran a second gunshot was fired, and from all indications it appears as if the bandit had been planning to rob them. She added that as she continued to call, a neighbour, Nicole Telford heard her screams for help and enquired who it was. Upon Telford’s response, she related what had transpired and was rescued by Telford. However, while at Telford’s home she said the bandit returned, banging on the door while stating that he was a neighbour who had found her bag, but they remained silent in the house. “How can you find my bag if you didn’t see what happened?” she questioned rhetorically, while noting that after she did not respond the bandit dropped her bag in the gutter. Asked if anything was stolen she responded in the negative, stating that it appears as if the gunman had tried to steal her phone, but left it behind after he was unable to unlock it. Kathy Vyphuis said she sought medical attention after the police arrived some two hours after the initial call. She explained that the police were unable locate the scene as they kept asking for directions. She was taken to the Diamond Diagnostic Centre for medical attention and was treated and sent away. She pointed out that while she was at the hospital she saw Stephenson who was also receiving medical attention. The woman added that the bullet had passed through his hands and entered his foot. Stephenson was later transferred to the Georgetown Public Hospital. Telford related to reporters that she heard two gunshots and jumped out of her sleep, and not long after she heard her neighbour screaming. “I investigated what happened from inside my house, she said [that] she was robbed and was shot. I peeped outside and manage to get her in my house,” she recounted. “We are hiding in a safe place in the house …the bandit came back and said is not she we did want is the driver. Open the door! Open the door! …we started screaming to get someone to assist …We called the police again, they said they were on their way …,” the neighbour relayed. She added that after several calls to the police they were told that the patrol had gone to the Diamond Diagnostic Centre with Stephenson, and then they asked that we get a taxi to take her to the hospital. However, police arrived and took her to the hospital. As Kathy Vyphuis spoke with this newspaper she kept saying that the shooting was terrifying and she was contemplating if to remain in the community. She stated that she was still terrified and has been unable to get any sleep since the incident. “If I can work hard as a woman, these boys or men need to get up and try to work and not rob people their hard earned money… it is unfair for us to be working hard and they want to come and rob us…,” she stressed. In addition, neighbours told this publication that there has been a spate of robberies in the community, and only as recent as Monday someone’s car had been hijacked while they were parked outside. No arrest has been made in connection with the shooting.